The Stiga 5 Star Vaporizer table tennis bat is great for attacking play and uses ACS technology to increase power and spin levels. 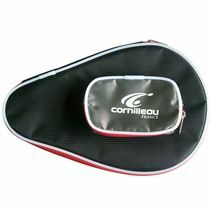 This 5 Star table tennis bat is for pro players and has a 5 ply blade covered with 2.0mm (0.08") thick sponge. This bat has an anatomical handle and will complement and encourage offensive gameplay. 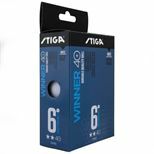 Get a FREE Stiga 2 Star Winner Table Tennis Balls - Pack of 6 when purchasing this product! for submitting product information about Stiga 5 Star Vaporizer Table Tennis Bat We aim to answer all questions within 2-3 days. for submitting product information about Stiga 5 Star Vaporizer Table Tennis Bat. We aim to answer all questions within 2-3 days. If you provided your name and email address, we will email you as soon as the answer is published. 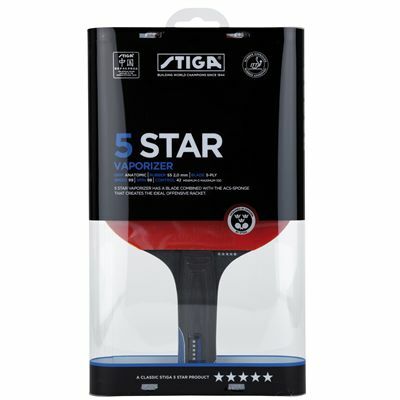 for submitting product review about Stiga 5 Star Vaporizer Table Tennis Bat.